An artist’s impression of the Persiaran Madge residential project by Bukit Kiara Properties. BOUTIQUE developer Bukit Kiara Properties Sdn Bhd is looking to expand its brand of niche residential projects out of its traditional market of Mont'Kiara to other parts of the Klang Valley. Group managing director N.K. Tong says the company is in an advanced stage of planning for two new projects in Persiaran Madge and Jalan Tun Razak in Kuala Lumpur. Subject to approvals, one of the projects is earmarked for launch in the third quarter of this year and the other in 2012. The project in Persiaran Madge will comprise 19 spaciously-designed residences on a 5-storey block with built-up area of 3,500 to 6,500 sq ft. They will be priced from RM3.8mil or about RM3,500 per sq ft. The Jalan Tun Razak project will have 160 fully-furnished service suites in a 20-storey block. The 750-sq-ft to 3,000-sq-ft units will be priced from RM1.2mil or RM1,500 per sq ft.
Tong says besides niche high-rise projects, Bukit Kiara Properties will also be looking for land of 50 to 100 acres to build landed residences in gated communities. “We may consider setting up joint ventures with landowners for such developments,” he says in an interview with StarBizWeek. Since its establishment in 2000, the ISO-certified company has finished two projects in Mont'Kiara Aman Kiara and Hijauan Kiara. Completed in July 2004, Aman Kiara was the first development in the country to feature strata-titled bungalows and condovillas. 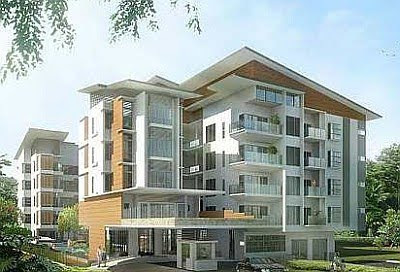 Aman Kiara was handed over to purchasers nine months ahead of schedule. Tong says the company's second project, Hijauan Kiara was completed in early 2008. It was the first condominium project in Mont'Kiara to feature a private lift lobby concept. In fact, the unique name of Mont'Kiara, which is today synonymous with exclusive upmarket condominiums, was coined by Tong. The residential enclave turns out to be a big hit among the modern upper-echelon of the local community and the expatriates. Tong works closely with his father, Datuk Alan Tong who is the group chairman of Bukit Kiara Properties. Alan, the founder of the Sunrise group, is dubbed the “Condominium King of Malaysia”. The father-and-son team is focused on improving the living standards of homebuyers by providing a good form of lifestyle living with ample facilities and security and property management. “We believe the relationship with our customers begin with the handing over of keys to their properties. Principally, our business is based on the core values of quality, innovation, caring and integrity. We do not rush through our projects and take about a year to launch a new phase or project,” Tong adds. Bukit Kiara Properties also goes the extra mile to ensure each of its projects has the stamp of individuality and offers first-of-its-kind features. In its latest development, the VERVE Suites series which comprises four condominium blocks in the western enclave of Mont'Kiara, the company takes great effort to offer fully-furnished designer suites with four different interior design themes in each tower. The four towers Viva, Vibe, Vogue and Vox have a total gross development value (GDV) of RM592mil. Each tower has its own unique sky lounge concept Vertigo, Hypercubes, Gardens of Concentrico and Versilica Sky Beach. The residents of VERVE Suites get to share the use of facilities of all four towers. Viva and Vibe Towers have been fully sold while 95% of the 255 units in Vogue Tower has been taken up. The final tower, Vox, is 80% sold. Tong says that by 2014, when the entire VERVE Suites development is completed, there will be a total of 100,000 sq ft of recreational facilities and four sky lounges. There will also be 87,000 sq ft of gross retail space for lease. Recreational amenities provided include swimming pools, BBQ areas, children's playground, reading pavilions, reflexology paths and landscaped podiums. The VERVE Suites is also setting new industry benchmark in terms of quality. The Vibe Tower has recently emerged as one of the highest CONQUAS (Construction Quality Assessment System) scorers for fully-furnished serviced apartments in Malaysia. The project obtained a score of 82.2, the highest ever for a high-rise project in the country. The overall CONQUAS score is derived from the sum of 10 categories internal floor, wall, ceiling, door, window, other fittings, roofing, external wall, external works, and mechanical and engineering works. At the end of 2009, the Viva tower obtained a CONQUAS score of 79.4. Tong says although CONQUAS assessment is not a requirement to be fulfilled by local developers, Bukit Kiara Properties adopts the stringent quality monitoring system introduced by the Building and Construction Authority of Singapore in all its projects to fulfil its commitment to build quality homes. “We believe that it is important for our projects to undergo this international quality assessment. After all, quality workmanship of a project is important as it enhances the value of the properties,” he adds. In line with the company's quality drive, a group of site supervisors, contractors and consultants will attend CONQUAS training each year to understand the quality aspects of property development. The company also implements the CONQUAS scheme to reward or penalise its contractors. Each year, Bukit Kiara Properties pays special bonuses to its contractors who meet the high-quality CONQUAS standards required of its projects. “This special bonus has been initiated since the company's inception in 2000 to promote quality workmanship,” Tong says.